Leo Vegas recently added new titles from Felt Gaming to their collection, including a huge range of new blackjack variants. Felt Gaming is a young company and we’re only just starting to see their games pop up at online casinos. Leo Vegas online casino are one of the first to have rolled out the suite of table games, including an array of unique blackjack variants. These titles each include special side bets and the layout is like no other game we’ve seen before, but after a while it does give a unique twist to a very familiar game. 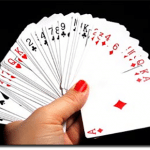 Blackjack with 21+3 Bet – A side bet where the player wins if the first two cards and the dealer’s up card make up a 3 Card Poker hand, with payouts up to 100:1. Blackjack with Perfect Pairs Bet – A side bet made where the player wins if the first two cards are a pair, with payouts up to 25:1. Blackjack Suit ‘Em Up – A side bet made where players win if their first two cards are the same suit, with payouts up to 50:1. 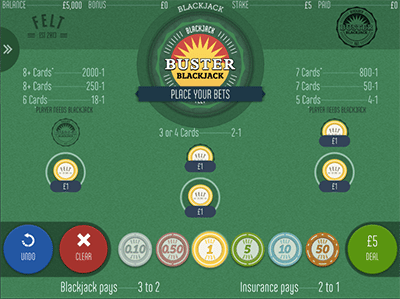 Blackjack with Buster Bet – A side bet made where players win if the dealer goes bust, with payouts up to 2000:1. Blackjack with Lucky Ladies Bet – A side bet made where players win based on certain combinations of the first two cards, with payouts up to 100:1. Blackjack with Lucky Lucky Bet – A side bet where players win if their first two cards plus the dealer’s up card equals 19, 20 or 21 with payouts up to 200:1. Blackjack with 6 in 1 Bets – Players can place up to six side bets from the aforementioned options. The graphics are unique and unlike any other blackjack tables we’ve seen before, plus there’s handy tutorials attached to show you exactly how to play. If you aren’t a member of Leo Vegas yet, sign up via our direct links and you can opt in for the $1000 welcome bonus too. Felt Gaming established in 2013 and is guided by CEO, John Parsonage, who was the former head of the casino department at Sky Betting and Gaming. The company pride itself on developing titles based on land-based casino games in North America and Europe for the online casino industry. 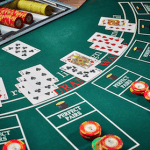 Along with the aforementioned side bet blackjack games, the provider also offers three poker games and a unique Double Ball Roulette game. Felt takes elements from land-based games to offer an authentic land-based experience with an easy to navigate layout for each of their games. The games have been created for desktops, laptops, tablets and smartphones, and players have the option to choose from either single or multi-player formats. So head to LeoVegas.com now to try these unique real money 21 additions.